Viola ‘Vi’ M. Crabtree, age 80 of Lynden, was taken to be with her Heavenly Father following a sudden onset of Leukemia, on Thurs., April 15, at St. Joseph Hospital in Bellingham. Born in Balko, Okla., on May 21, 1929, Vi was the daughter of Peter and Malinda (Unruh) Karber and moved with her family to Ferndale in 1935. She graduated from Ferndale High School in 1947 and on May 24, 1949, married Keith Crabtree in Lynden. A homemaker, Vi also helped Keith on their family farm and throughout the years also worked at the New Crescent, the fertilizer department at Western Farmers, and as a teller at the former Rainier Bank Branch, all in Lynden. 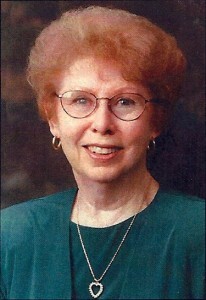 Vi loved music and for many years was an organist for Word of Life Church in Lynden, where she and Keith were members. She also loved camping and RVing with her family. Preceded in death by her husband of 60 years, Keith, in September 2009, she was also preceded by her son-in-law Gary VanEtten in November 2009 and brother-in-law Chuck Pierson in 2004. Vi is survived by her children Loren (Vickie) Crabtree of Sumas, Brent (Marcia) Crabtree of Lynden, Candace Corcoran of Hayden, Id., and Cara VanEtten of Lynden; nine grandchildren, nine great-grandchildren; sister Esther Pierson of Bellingham, and numerous other relatives. Visitation hours were from 11:30 a.m. to 1:30 p.m. on Tues., April 20, at Gillies Funeral Home in Lynden. Funeral services were conducted on Tues., April 20, at 3:00 p.m. in Word of Life Church, 1986 Main St., Lynden, preceded by burial in Lynden Cemetery at 2:15 p.m.
Memorials in Vi’s name may be made to Gain Ministries, c/o Word of Life Church, 1986 Main St., Lynden, WA 98264 or to Focus on the Family, Colorado Springs, CO 80995.